Do remember life before Post-Its? Do you remember life before Post-Its? What did we do before Post-It notes? Honestly, I don’t use many, but when I want one, I want one. They are an easy way to attach a note to a piece of paper without having to write on it or find a paper clip. It’s crazy to think they didn’t even exist when I was a child! 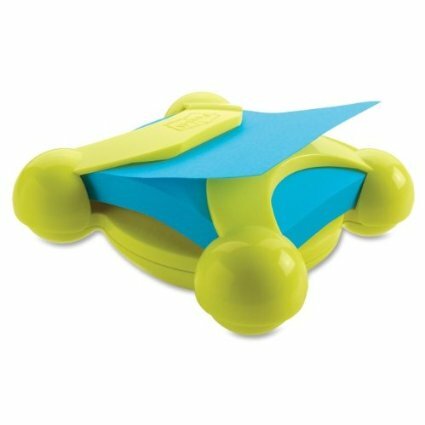 Includes one 90-sheet pad of 3 x 3 Post-itÂ® Pop-up notes. Portable and refillable box note holder keeps your Post-it® Notes where you need them, when you need them. Fun way to take notes on-the-go. Carrying case protects notes in your bag. Convenient note holder keeps notes where you need them, when you need them. Pack includes one 90-sheet pad of Super Sticky Notes in Jewel Pop and Electric Glow colors. Refill with any 3×3 Post-it® Notes. I do wish there was an eco-friendly version of Post-It notes made from recycled paper content. If you know of one, please let me know. My daughter especially likes the diamond shape one. Do you need a Post-It holder or dispenser? Do you need Post-Its at all? I think they have improved productivity and organization in my life. I also like how as a teacher I can leave notes on my students work without marring it. Holders and dispensers help organize one’s desk, but these are the first ones I’ve ever owned.